CFS (and PCOS) Please read Frances' blog post about CFS at her blog Fancy Like That and follow all of her social media I spent close to stalker-like hours on her Pinterest page. Although it may seem like fun and games to be permanently having a sick day, it gets boring fast... especially when you don't always even have the brain capacity to do things like binge-watch great TV shows and read books that have been on your to-read pile forever. I'm currently working on a programme with my CFS clinic to raise my energy levels and while that is working it also means I have to take 15-minute breaks every half hour, no matter what, and I think that can be difficult for people to understand too. More energy! Ha. But seriously... since diving (slash being dunked) into the world of invisible illnesses I think the biggest thing that would make a difference for me is just more understanding - by doctors and the general public - of invisible illnesses and of how to talk to the people dealing with them. Join a Facebook group! I wasn't sold on going to the support group my doctor found because of the travel and general energy usage it would involve, but I've felt a lot less alone since finding so many places online where I can talk to other people who have the same issues as me and actually understand what I mean when I say I'm having a bad day etc. I'm also really into bullet journaling at the moment - it's a great creative outlet for me (although it doesn't have to be decorative to work!) and I find it so helpful to have everything laid out in ways that make sense to me. I'm incredibly lucky to have a bunch of amazingly supporting friends and family and my boyfriend, who I live with. The best kind of support is when people say that they've read up on your illness or ask questions that show they're really trying to understand. Having said that, I also really value the friends I have who don't bring it up at all unless I do - sometimes you need to be taken out of the chronic illness bubble and gossip about so-and-so's latest Instagram post or whatever and forget about everything for a while. It doesn't make me feel great, but I know that they mean well - I just need to work out a way to tell them that I'd rather not hear it without being rude! I've definitely had to change the way that I think about certain relationships. I'm usually someone who takes on the 'Organiser' role in friendship groups, and I've had to tell myself to step back from that because I know that logistics and things are going to drain my energy. And in my relationship with my boyfriend, I have to work hard not to feel like we've gone from equal partners to carer and patient sometimes, especially on my worse days when he not only has to go to work while I stay home, but also comes home and does all of the cooking and cleaning, plus looks after all of our pets. And when he goes away - on holiday with his friends, or for work - if it's for more than a couple of days I have to have my parents come to stay with me or go to them because it's too much to try and keep myself and the house going on my own for too long. I think for me the key is talking about that kind of stuff with the people involved and reminding myself constantly that they're doing it because they love me and not because they think I'm incapable. With my boyfriend, we've recently started having set-aside 'date nights' in the week, which is something I always thought was a bit cheesy before, but now it's good for us as a time to really spend time as a couple. Sometimes I'll try to hide how bad I'm feeling - emotionally and/or physically - but I'm trying to avoid doing that... it always comes out anyway, and it's not good for me to bottle things up! Yes and no. I'm in a weird place where CFS/ME is sort of 'in vogue' at the moment - there have been a few features about it on the news and radio recently in the UK, so my doctors are keen for me to understand that they understand. 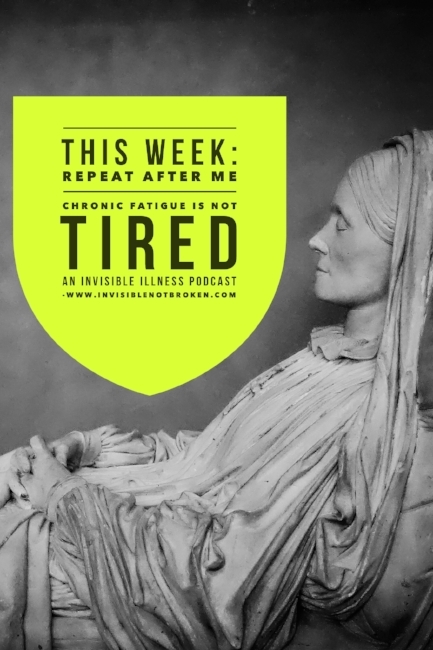 However, I do find it difficult sometimes to go to appointments alone, especially when my brain fog is particularly active, and I've had difficulty in the pat conveying that to doctors. Humour, usually of the gallows variety, and listening to podcasts - usually about true crime. I'm hopeful that I'll find a way to manage my symptoms and that I can turn this whole period of my life into something positive and productive. I'm fearful of having a relapse into worse symptoms, and of my loved ones getting bored of my limitations. It's made me very aware of my privileges when it comes to healthcare and having a support network, and spending so much time stuck in my own head has also made me get to know myself a lot better, too!